Want to know who you are—really, truly Are? 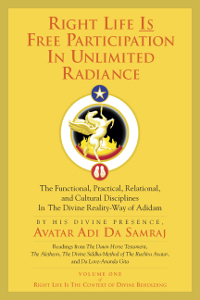 Then read on—this book breaks through the illusions to reveal that ultimate Truth. . . .
You propose yourself as ego-“I”, as “self”-idea —“self”-bound, separate, “self”-contracted, full of “problem”. However, in Truth, and in Reality Itself, you are never (and, therefore, you are not now) the separate ego-“I”. No matter what conditional state or “experience” arises (whether waking, or dreaming, or sleeping), “you” Are The egoless Mere Witness and Immutable Transcendental Spiritual “Substance” of it. It is not a seeker’s struggle to grasp what Avatar Adi Da is Saying in “The Five Reality-Teachings”—it is a Revelation Given by Grace. And that Grace will occur simply by fulfilling the Master’s Admonition to “Notice” what He is Communicating in these Teachings. Through these Teachings, Avatar Adi Da Calls us to examine our most fundamental presumptions about what it means to exist as an apparently separate “self”. The breaking-up of these illusions is served by the simple practice of Listening to the Master Speak about Reality Itself and the Truth of Reality. Through this practice of profound Listening-reception, the devotee begins to be Awakened to the Truth of “Perfect Knowledge” through the Gift of the Divine Master’s Transmitted Revelation. 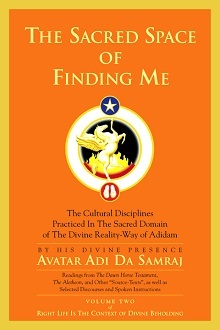 Over half the book is never-before-published material, including, notably, Discourses that Bhagavan Adi Da Gave to a small gathering of devotees at Tat Sundaram Hermitage (Northern California) in late 1998 and early 1999. Notice This is the final book in the five-book series of core Instruction on the foundation practice established in the Second Congregation of Adidam. 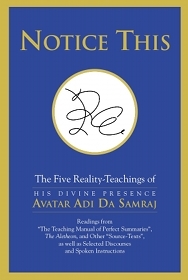 While the previous four books covered "radical" devotion and right life, this book is a depthful contemplation of "Perfect Knowledge"—with Avatar Adi Da's "Five Reality-Teachings" as the core structure of the consideration.